"Oh my God, I love Paul Rudd." "Didn't you love him in 'Knocked Up' and 'Anchor Man'?" Yes, Paul Rudd has an enormous fan base. Huge. Women wish their husbands were like him, men want to grab a beer with him, kids want him to jump on a trampoline with him. I'm with you. I get the whole Paul Rudd thing. You can relate to him, especially in "Our Idiot Brother." We all have one, the brother/sister/grandmother/cousin who we love dearly but sometimes they make us want to run into a bathroom at family gatherings, stick our fingers in our ears and hum as they bang on the door asking us if we know where we keep our extra change/underwear/brandy. 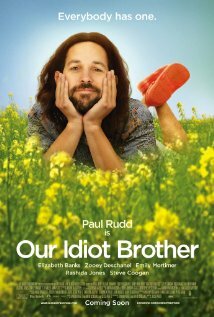 "Our Idiot Brother" Ned is like that. He's actually sort of a well meaning overgrown puppy who doesn't realize the destruction be brings to a house as he slowly moves to each of his sister's houses following a jail stint for drugs. Ned's happiness is hanging out with his dog and girlfriend at their organic farm and yeah, maybe smoking and sharing a little weed. When he loses the girl and his farm it's then up to his family to help him get his happy back, but on their terms. Played by Zooey Deschanel, Elizabeth Banks and Emily Mortimer, Ned's sisters do their best to try and get their brother on the straight and narrow. The question is how do you change someone to fit the mold YOU want them to fit into. What if your happy doesn't coincide with what someone wants YOUR happy to be? "Our Idiot Brother" is a great take on what it means to be a family. Do you love each other and accept each other because you have to or do you REALLY like your family? How far would you go for them? This is a slow paced and at times funny film with groovy music. If you're looking for an interesting character study movie, this is it. If you have a family member who you're baffled by, take him to see this movie. You never know, it may turn out that you're the one who baffles him.